Mr. Fawad Sadri is a legal consultant of Tolo Legal Services with over 14 years of experience in key departments of the Attorney General's Office as well as the Election Complaint Commission. 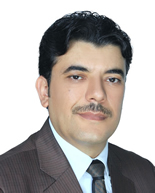 He has graduated from the Law and Political Science Faculty of Kabul University in 2000. He demonstrated professional and practical knowledge in various fields of law while working as a prosecutor for the Crimes Investigation Department (CID), the Inspection Department, the Counter-Narcotics Appellate Prosecution Department, and the Paghman District Prosecution Office. His professional work ethics proved successful and granted him promotion to become the Director of the Department of Overseeing at the Kabul City Prosecution Office. He continued his profession as the Director of the Paghman District Prosecution Department and served as a Commissioner of the Election Complaint Commission before joining Tolo Legal Services. As a State Attorney he has broadly dealt with and specialized in commercial cases and land grabbing issues. He is legal adviser and studying in Germany on facilitating the work of Afghan refugees in the Germany and other European countries. Based on his experience and ability, he provide legal advices on how to proceed, clarify and certify Afghan refugee documents to the German government and other European countries.